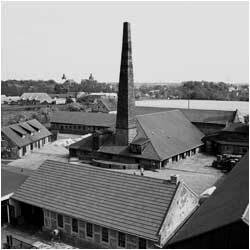 By the time Hundisburg Brickworks was founded in 1882, the narrow-gauge railway had already become a ubiquitous feature at factories, building sites, clay pits and fields. It was thus no surprise that a railway with a 600mm gauge was used to transport clay at Hundisburg. However, although narrow-gauge locomotives were introduced in the late 19th century, the first diesel locomotive was only used in Hundisburg in 1946. Since production methods remained virtually unchanged from 1903 until the closure of the brickworks almost 90 years later, the narrow-gauge railway was also preserved in its original form. The existing engines and tipper wagons were saved from the scrapheap and restored by local enthusiasts. Additional pieces of equipment have been added over the years, and the collection now comprises 10 working diesel locomotives and 15 rocker dump cars, which can be shown to visitors to the brick- works. A fascinating ride on the narrow-gauge railway about 2km long being pulled by the locomotives and passing historical kilns, chain-and- bucket excavators and the former clay pit will be the highlight of your visit!